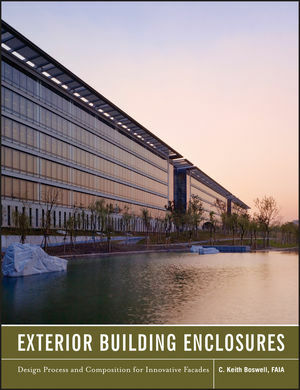 Focused on the design process for architects and related professionals, this book addresses the design and execution of sophisticated exterior building enclosures for a number of commercial building types and in a variety of building materials. It focuses on the design process by delineating enclosure basics, the participants (owners, architects, engineers, consultants) and their roles and responsibilities through collaboration, and tracking the design process through construction. This comprehensive handbook covers all of the factors that affect the design of a building enclosure, including function, visual aesthetics, performance requirements, and many other criteria. In-depth case studies of projects of various scales, types, and climate conditions illustrate the successful implementation of exterior wall enclosure solutions in brick masonry, stone, architectural concrete, glass, and metals. C. KEITH BOSWELL, FAIA, serves as Technical Director of the San Francisco office of Skidmore, Owings & Merrill (SOM), orchestrating and overseeing detailed design and construction documentation for all San Francisco projects. His experience includes high-rise office buildings, museums, retail spaces, government projects, amusement parks, and international and domestic airport passenger terminals.